Ho there, brave adventurer, dare you challenge the dragon, to then away with the Dragon's Loot? Click here to play! Ahem! Sorry, something stuck in my throat had me talking all strange. Well, do you think you have the jewels to take on a 300-foot tall monstrosity with teeth the size of a pine tree and flaming breath that can burn a knight to cinders in his armor? Oh, you do have the jewels? In that case, the Dragon's Loot should be an easy mark for a fine young warrior like you. Tell you what, though, the dragon recently nicked off with the village's favorite bar wench. She can hold 10 beer steins at once, that lass can. In each hand! I think her name is Jenny or Phillibette or something. I don't remember, I was always drunk when she told me. Anyway, everyone in the village is sure to reward you if you bring her back to us, and she has always talked about marrying a dashing knight. Put it this way - you'd be in with a chance. Look at the time! That dragon ain't going to slay itself, now is it? You'd best run along and kill the beast. Don't forget your sword and shield, and it's that big castle on the top of the hill, not the smaller one near the swamp, you can't miss it. After you've murdered the scaly creature, you can take the Dragon's Loot, rescue the bar wench, and settle down in this nice country village with your massive fortune. You won't forget this old stranger when your swimming in gold, will you now? If you want to live the noble life of a wandering knight, saving damsels and looting the lairs of your conquests, then charge with sword in hand to the Dragon's Loot slots. 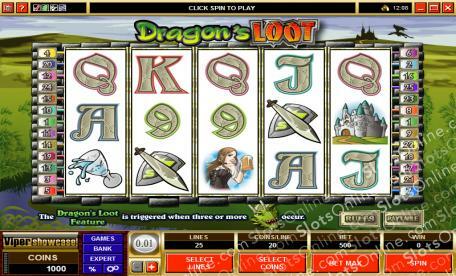 The Dragon symbol is the scatter symbol in this game, and it triggers a bonus feature as well as paying out on the total bet. 2 symbols payout 2 times the bet, 3 payout 5 times the bet, 4 payout 20 times the bet, and 5 symbols payout 100 times the total bet. The Knight symbol is wild, and it substitutes for any symbol other than the scatter symbol. It appears on reels 2, 3 and 4. The Dragon's Loot bonus is triggered when 3 or more Dragon symbols land on the reels. In the game, the player enters the dragon's lair to find loot. 5 piles of loot are offered, and the player chooses 1 to reveal a random number of free spins with a prize multiplier. The free spins are then carried out.